Description: Bankruptcy Transaction File. An excellent tool for bankruptcy attorneys, whether representing the debtor or the creditor & whether filing under Chapter 7, 11 or 13. Designed by an experienced bankruptcy firm, this file can effectively manage a case from start to finish in the most professional manner. 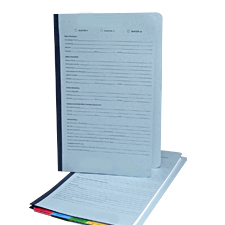 Effective Organization: Pre-printed mylar tabs - to properly separate, outline & arrange all aspects of a bankruptcy filing. Pre-printed form on folder cover: Franklin Mills will print to your specification to help organize all information, including important contact information & deadlines. 2" Expandable Pressboard folder - a legal size pressboard folder with a 2" expandable tyvek binding allows for maximum capacity and durability. Franklin Mills Co. �Experience is the difference.